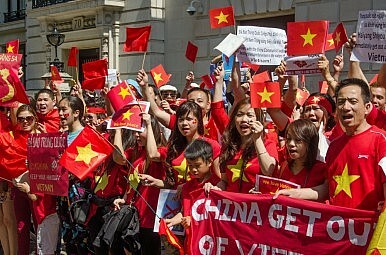 Laos’ new courtship with China has Vietnam worried. If China is trying to create a split in ASEAN over the South China Sea issue, it seems to be working. Vietnam, in particular, must worry about becoming isolated thanks to new tensions in its ties with both Laos and Taiwan. Bounnhang Vorachith, who was just elected as the new president of Laos on April 20, made an official visit to Vietnam from April 25-27. Vietnam is the first country Bounnhang has visited since his appointment. The visit was considered a significant contribution to the deepening of traditional Vietnam-Laos relations. But the recent meeting also played an important role for the South China Sea disputes. Just one day before the Lao president’s visit to Vietnam, Chinese Foreign Minister Wang Yi said in a remarkable statement that China had reached a four-point consensus with Cambodia, Brunei, and Laos about resolving the South China Sea disputes. Namely, those countries agreed that ASEAN claimant states should negotiate disputes with Beijing directly, not through the group. That means the South China Sea disputes should not cause any problems between China and the ASEAN group, according to Wang. For Vietnam, government and public opinion alike, it was jarring to see Laos take this position on the South China Sea, particularly as the country and Vietnam are often described as “brothers.” Even more importantly, Laos is the rotating chair of ASEAN this year, meaning its decision on every issue can have a significant influence on the region. Thongloun Sisoulith asked Wang Yi to convey his warm greetings to Premier Li Keqiang and expressed that Laos has benefited much from China’s great help for a long time. China’s assistance in the launch of Laos’ first artificial satellite, along with the co-construction of the Laos-China railway, will strongly promote Laos’ development. The new government of Laos is willing to carry forward the traditional friendship and deepen mutually beneficial cooperation with China. Laos welcomes Chinese enterprises to invest and conduct business in Laos and will create better conditions for them. Laos stands ready to work with China to continuously promote ASEAN-China cooperation. While holding the role of ASEAN chair, Laos is weighing the pros and cons of its different diplomatic options. Thongloun’s first diplomatic outing is scheduled to be a trip to Russia from May 19-20, to celebrate the 20th anniversary of ASEAN-Russia diplomatic relations. Vietnam will watch carefully, because of Russian Foreign Minister Sergei Lavrov’s previous comments against the internationalization of the South China Sea disputes. Laos is now not only a close friend of Vietnam, but a diplomatic VIP, courted by numerous parties. For Hanoi, that may mean losing a long-time partner’s support on the South China Sea issue. Du Nhat Dang is a reporter for Thanh Nien newspaper. He graduated from the Faculty of Journalism and Communication, University of Social Sciences and Humanites in Ho Chi Minh City.